Purpose: The aim is to try to build a model for measuring and assessing the simultaneous effect of the three components of the intellectual capital (IC) management on the growth of innovative SMEs. In this first stage of research, the model was tested in a representative sample of innovative SMEs from Galicia, where the performance construct was the cumulative growth measured in a three years period. 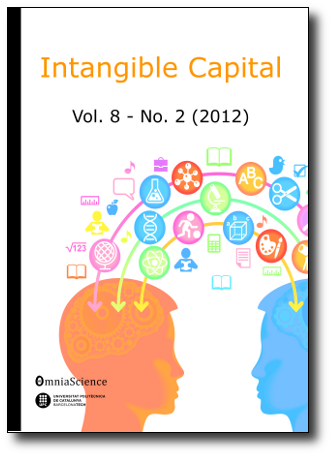 Design/methodology/approach: This empirical work has been designed with the aim of (1) selecting the best variables from each IC component (human capital-HC, structural capital-SC, relational capital-RC) at innovative SMEs for explaining cumulative growth; and (2) assessing how much the IC management at innovative SMEs could contribute to their growth. A structural equation model is developed and tested. It allows the identification of the key variables that innovative SMEs are encouraged to manage (17 variables in the current stage) for boosting their growth. Findings: In the Galician case, HC is the basic, starting point for the SMEs’ growth. HC seems not to be able to directly influence on growth if not through SC and, in a very low degree, through RC. Thus, the key seems to be the SMEs’ capability for transforming valuable knowledge from the HC into organisational value (i.e., SC). Research limitations/implications: The limited sample of 140 SMEs and the regional scope (Galician region) may limit the possibility for directly spreading findings. However, the double test developed (cumulative growth measured in two year and in three year period) and the improved overall goodness fit indexes, both allow pointing out to a future research where final variables can be set. Practical implications: Results could allow SMEs practitioners a better understanding about variables of IC on which they ought to focus their management efforts. In the case of public decision-makers, outcomes could inform about the key aspects that they should improve for playing a more decisive role in the innovative efforts of SMEs. Originality/value: The originality of this research could be twofold: the medium-term perspective for assessing impacts, and the inclusion of the agents from the system of innovation in the RC component. The latter has allowed assessing the contribution of the institutional system for supporting innovation in the case of SMEs. The former has allowed identifying cause-effect interactions among IC components to explain growth.